The interior design and furnishings in this building at the Last Mountain House Provincial Park in Saskatchewan, Canada, is a replica of the married men's living quarters dating back to 1869. Nicely made beds in tiers, jackets hanging from the hooks, an old mud chimney, a fireplace and a table set for a meal is how the married men's living quarters looked on a daily basis. Visitors to the Last Mountain House Provincial Park can tour through this building and see how people lived during the last days of the Saskatchewan fur trading era. Houses, railroads and other buildings were soon built in the region and the days of fur trading soon come to an end. 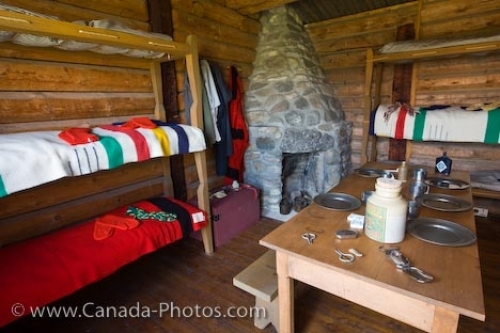 Interior of the Married Men's quarters at the Last Mountain House Provincial Park, Saskatchewan, Canada. Picture of the living quarters used in the fur trading years at the Last Mountain House Provincial Park in Saskatchewan.